Today we are excited to bring the most advanced WordPress split testing system to the Visual Builder. 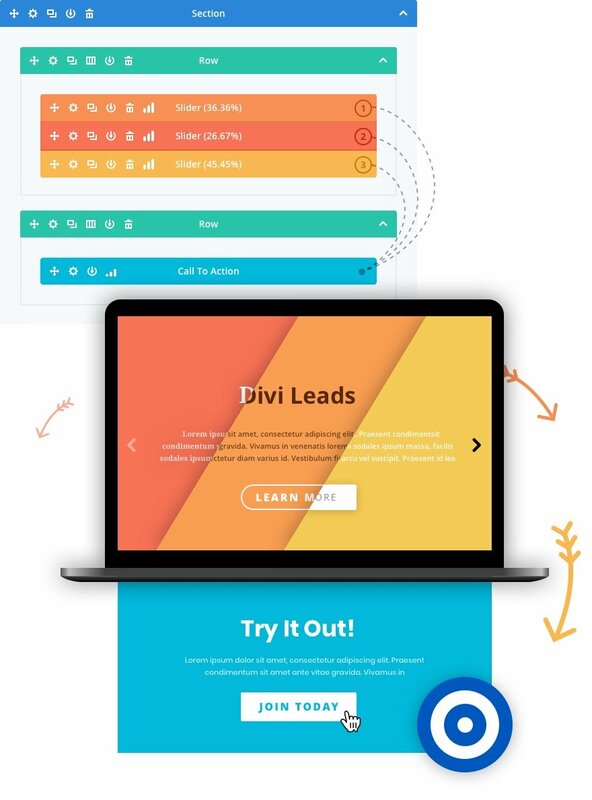 Divi Leads is a powerful split testing system for the Divi Builder that allows you to broadcast different versions of your page to different visitors and figure out which version is most effective at converting your unique goals using powerful stats and insights. You can test different colors, different headlines or entirely different layouts and Divi Leads will tell you how each variation stacks up in the battle for more clicks, more sales and higher engagement. Once the test is over, you simply select the highest performing variation. Today, we are bringing Divi Leads to the Visual Builder where you can now create, manage and track split tests using our modern front-end interface. Improve conversion rates through automated testing. Validate your content and design decisions using real data. Every website has a purpose. Maybe it’s trying to engage readers, sell products, or build leads. Whatever the case may be, what matters most is how effective your website is at accomplishing those goals. But how effective is your website really, and how would you even know? How do you validate your content and design decisions? How might certain changes to your page improve or impede your page’s effectiveness? There is only one way to figure that out: to make changes and track the outcome of those changes. This isn’t an easy problem to solve, and the testing solutions available to most WordPress users are disparate and confusing. That’s where Divi Leads comes in. Divi Leads is a split testing and conversion tracking system built right into the Divi Builder. Since Divi Leads is a part of Divi, it has the unique advantage of understanding all of the content on your page and the unique ability to integrate at the module, row and section level. With Divi Leads, you can test anything, set specific goals and figure out how each change you make improves or decreases your conversion rate. 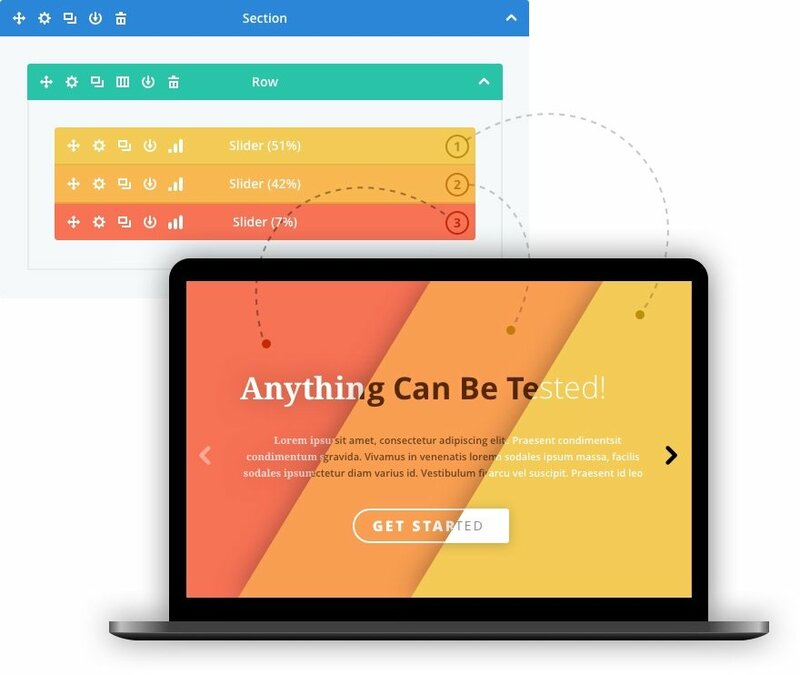 The Visual Builder and the Divi Leads split testing system is a match made in heaven. The beauty of Divi Leads is that it was built right into the builder, which means anything can be tested. You can test changes to individual modules, such as adjusting buttons colors or heading text, or you can test entirely different sections of content. You can start big and narrow your focus with each test, systematically improving your page and reaping the rewards. When you start a test, Divi Leads will duplicate your test subject (whether that test subject is a module, row or section). You can then make changes to each variation independently. Once your two variations are ready, Divi Leads will display each version to different visitors and track the results. You can create an unlimited amount of variations. Want to know which headline is most effective at grabbing your visitor’s attention and reducing bounce rates? Try out 10 if your favorite headlines and see which one comes out on top! When you create a new split test, you give Divi Leads a goal. Any module, row or section on your page can be a goal. Depending on the goal you select, Divi Leads will track unique statistics that can be used to determine the conversion rate of that goal. If you select the Shop Module as your goal, Divi Leads will track sales statistics to determine how changes to your page increase or decrease sales. 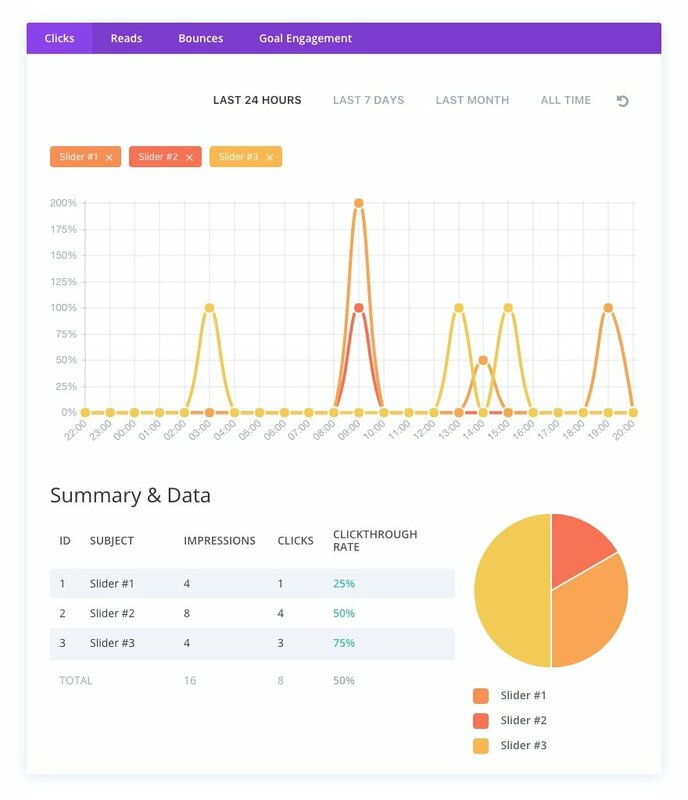 If you select the Email Optin module as your goal, Divi Leads will track subscriber activity to determine how changes to your page affective the growth of your email list. If you select the Contact Form as your goal, Divi Leads will track form submissions to determine how changes to your page affective lead generation. Since Divi Leads is built right into the builder, you can get very specific with your goal and Divi Leads will take care of the rest. After you start a split test, Divi Leads will begin tracking the results immediately. These results are presented in a series of graphs and charts that show you exactly how well each version of your subject is performing. After enough data has been collected, it will become clear which test variation is the best. When you end your split test, you can easily select your highest performing variation as the winner. Starting, managing and ending split tests in the Visual Builder is easy! Starting a split test is easy. Simply right click on any element on your page and choose the Split Test option. Whatever item you have chosen to test will be automatically duplicated so that you can begin customizing both variations. If you want to test more than one variation, simply duplicate the item. You can create an unlimited amount of testing variations. In this Visual Builder, you can cycle through each split testing variation using the arrows that appear when hovering over the test. As you cycle through, you can edit each version individually. You can also get a list of all split testing variations in Wireframe Mode. After you have selected your split testing subject, you will be asked to select your goal. Every page has a purpose, and every page should have a clearly defined goal. This is the thing you want your visitors to do when they land on your page and as you move them along your conversion funnel. In Divi, any module can be a goal. Depending on which module you select as your goal, Divi Leads will track a different set of statistics that will help you determine the effectiveness of each split testing subject variation. Let’s consider the following example. You run a local coffee roaster and sell bags of coffee through WooCommerce using the Divi Shop Module. On your sales page, you have a Header Module, a row of Testimonial Modules and the Shop Module that displays your list of products. Your goal is for people to purchase coffee through the Shop Module, and you want to increase conversion rates as much as possible. You have 20 testimonials from your customers, but you only want to display 3 of them on the page. How do you decide which 3 of your 20 testimonials are the best? These testimonials are very important and will have a direct impact on sales through the Shop Module on the same page. This is the perfect time to use Divi Leads to test different testimonials to see what impact they have on sales. The Testimonial Module is your split testing subject, and the Divi Shop Module is your split testing goal. Once you have started a split test on the row of Testimonial Modules, Divi Leads will display different testimonials to different visitors and track which visitors are more likely to purchase coffee through the Shop Module. After the test has been running for a while, it will be clear which testimonials are most effective at converting sales and you can end the test and use the highest converting variation. While a split test is running, it’s easy to view the results by clicking on the stats icon. This icon will appear amongst the split testing subject’s hover buttons. Stats are displayed in a series of tables, charts and graphs that give you a clear picture of the effectiveness of each variation and how it compares to other variations in the test. Nick , I so look forward to using this new tool to study my websites and monitor my progress or need for revisions or tweaks . Happy New year to you and all the folks at Elegant Themes . This looks awesome! Can’t wait to put it to use! Can you verify if better leadg forms like Wufoo are coming? Once again, Divi introduces a game-changing feature. One question: How does Divi decide who sees which version? It works in a round-robin style for each unique IP Address. Basically, if you have 4 test subjects, the first unique visitor will see the first subject, the second unique visitor will see the second subject, and so on until it reaches the last subjects and the loop resets. If you visit the page multiple times from the same IP Address you will always see the same test subject. well, I am currently experimenting with the split-test feature. Unfortunately there is either a bug, or I’m doing something wrong. I do see both pages while having the same IP address. Simply opened the page again on a new tab and the second edition of the page was shown. Yes, would like to know more. Will look at documents. Thanks for that update Nick. But like a child I not happy because I don’t have what I was promised. Hi Nick. Attachements in contact form modulealso on the way ;)? Can you please slow the feature updates down to allow for more testing? The bugs that come with every “feature update” are very frustrating and make me look bad. Yes! Agreed! This constant barrage of “new features” seems to screw up something else that was previously working fine on existing client sites. Combine that with slower and slower support, and Divi is turning into quite a frustrating experience. Nice one Nick! This looks very interesting and I think it could help difficult clients see that their preferred module is not producing as much a more modern or optimized option would. WOW 😮 I absolutely love this update. Amazing work guys. Auto filling the link fields with existing pages/posts will make Divi the most perfect builder in the world. Probably this is a very interesting implementation, but personally I would like you to finally include CPTs with the chance to create different templates for the different CPTs. That really is amazing. Again. Game changing. Keep up. No idea how you are able to push so many thought through updates in this short timespan. My respects. Merci boucoup pour cette option , elle sera d’une grande utilité.bravo for the team of elegant theme. Does this work with page caching plugins? Following this question as it is a key one ! Do not know the specific answer for all situations, however some caching plugins and cloudflare as well offer page specific exclusion rules. Might be helpful to consider these if no results are coming up for one of the test subjects, but keep in mind, page speed might then factor into things! you guys include this amazing stuffs in the VB, but DIVI still don’t have a decent section divider like elementor ! Are you referring to how, in Elementor you can resize column widths etc. on the fly by dragging the hatched dividers? Also Elementor has extra preview sizes for Laptop and Mobile Landscape, but I note only one option for tablet. Should we have that as well or is the thinking that it is not necessary? One thing is for sure Stephen we are going to get a columns update. FOR ME… The sooner the better. Hey Nick, I have been wondering how to use split testing on one section page where we are trying to track which background is better. Awesome! I look forward to testing this out. Cheers! What if I have multiple CTA’s and each one should be considered the “goal”. The way I see it currently, only one module can be considered a goal but that doesn’t work if I have multiple CTA buttons throughout the page which all are the same goal. I couldn’t find the right forms to fill in online so I invented my own official form and sent it to the boss, Oh and that’s me. When I received the form from myself I approved it immediately. You now belong to me! Cool stuff to split test minor changes. But to start effective A/B testing – I need completely different pages / site structures. Q: Will DIVI support PAGE split test in the future also? WOW. This looks really great! This is a great update! But just one question, how does this effect SEO having multiple versions of the same page/module? That’s a good question. Look forward to learning the answer. Yesterday I was wondering if I could split test the landing page I just created and today this email arrives in my inbox – amazing timing guys! Can’t wait to look at this. Hi. I would like to suggest an idea for divi animations. Do you consider make the animation effects play again after user scrolls up? I don’t mean loop. I mean when the user scrolls up, to see again the animation effect that played once. I was thinking and expecting this option as well which left me to still use the js code that allows animations while scrolling up or down the page. Hope it will be included…just hoping. Nevertheless ET stellar products have pioneer new dimensions in web design for the 21 century! One more of those not really necessary features. Does it even work nice with SEO? Why don’t you give us e.g. custom types support? Or other more important features? Maybe you should make a uservoice (or similar) page to let users vote for new features? Awesome job on Divi Leads. Look forward to working with it. Thank you Divi Team! The Divi split testing feature is awesome and very useful. Great Job! Lot’s of thanks to Divi team. Wish to try this new feature split testing. Hope all divi users will enjoy it. Is this feature available in the Divi Builder Plugin, or just the Divi Theme? While I enjoy the ease of using Divi, I am really reconsidering continuing with this on our website if updates are going to be rushed out like this. Hi Nick, this is awesome. How do I test two entire sections against each other? It always seems to allow me to test a subsection of what I selected, not the separate sections against each other.